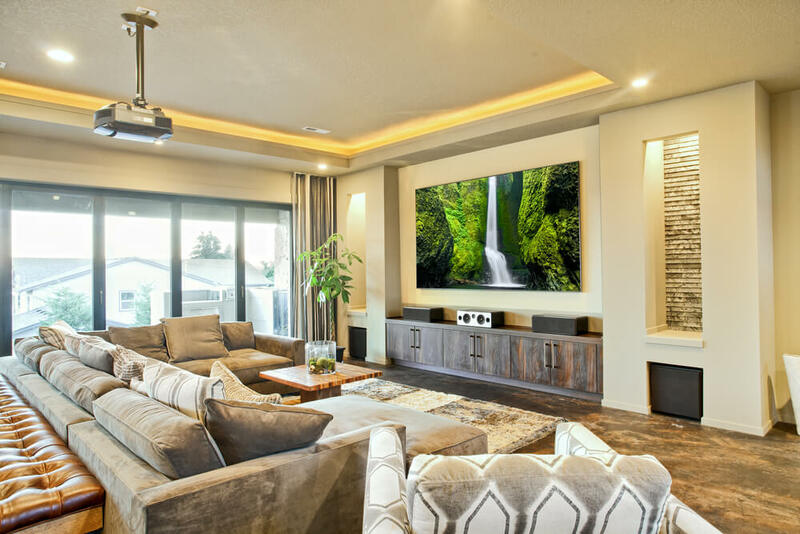 Welcome to our gallery featuring a mind-boggling variety of living room sectionals in every texture and configuration imaginable. 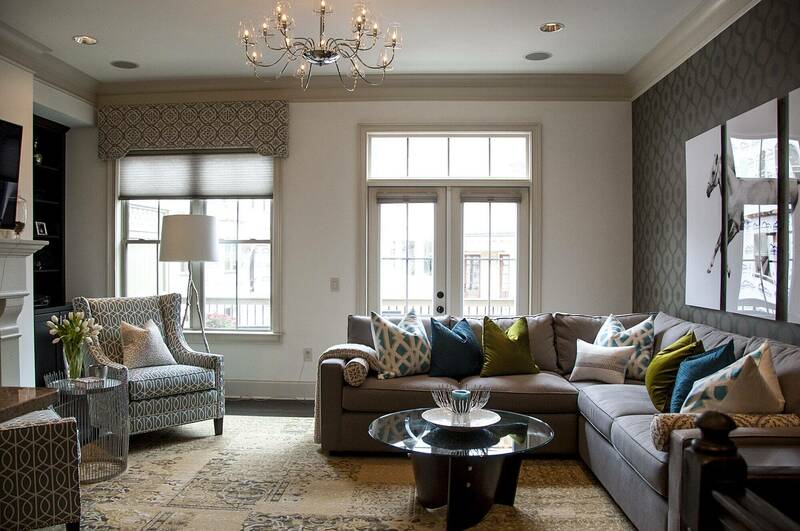 The sectional sofa has evolved as a piece of furniture into something wholly transformational for living rooms. These innovative seating arrangements offer the kind of spontaneous rearrangement that more permanent furniture sets could only dream of. Whether U-shaped, L-shaped, semi-circular, or taken apart and shifted into any pattern imaginable, the living room sectional sofa has become a staple for modern families wanting versatile comfort in their lives. 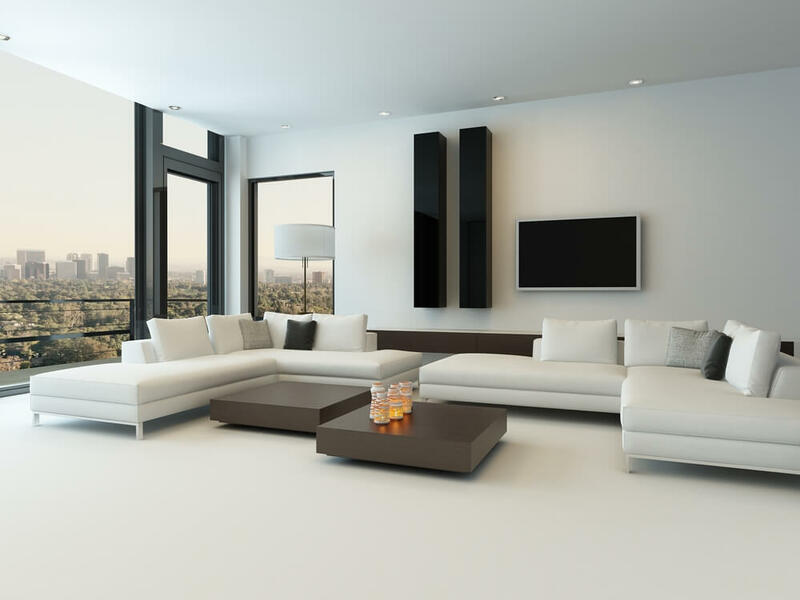 Within this collection you’ll see modern, mid-century, pillow back, camel back, and every other type of sectional sofa, often paired with rich materials throughout the flooring, walls, and tabletop surfaces of these living rooms. We hope that these exciting designs plant ideas in your mind as much as they have in ours. 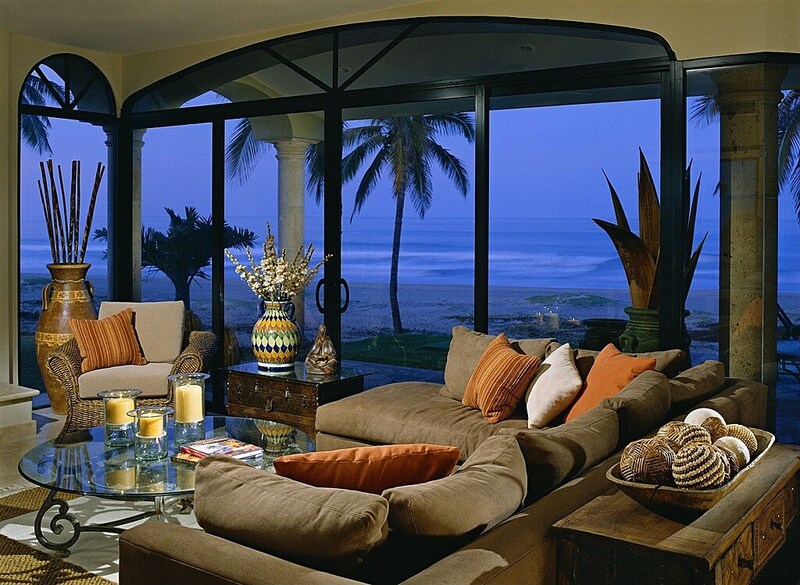 This luxurious room features an L-shaped living room sectional in beige, near large sliding patio opening. 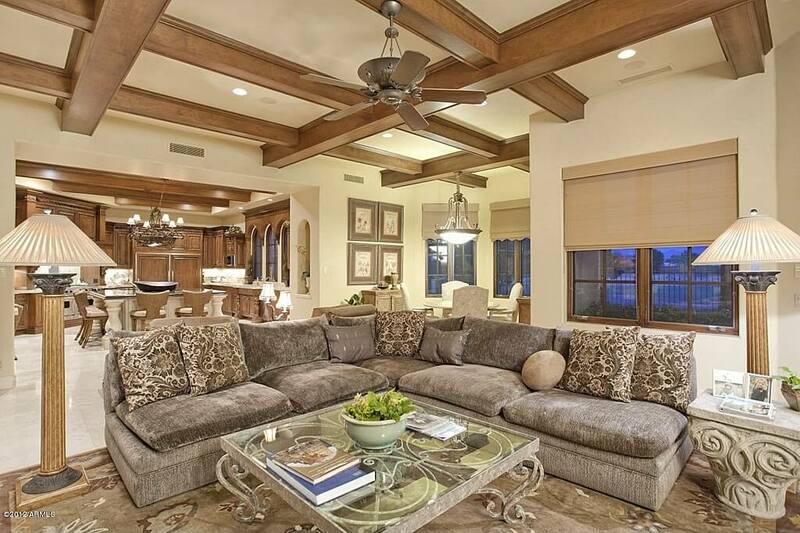 Rich stone textures and high vaulted ceiling with exposed beams complete the look. Shop this look. 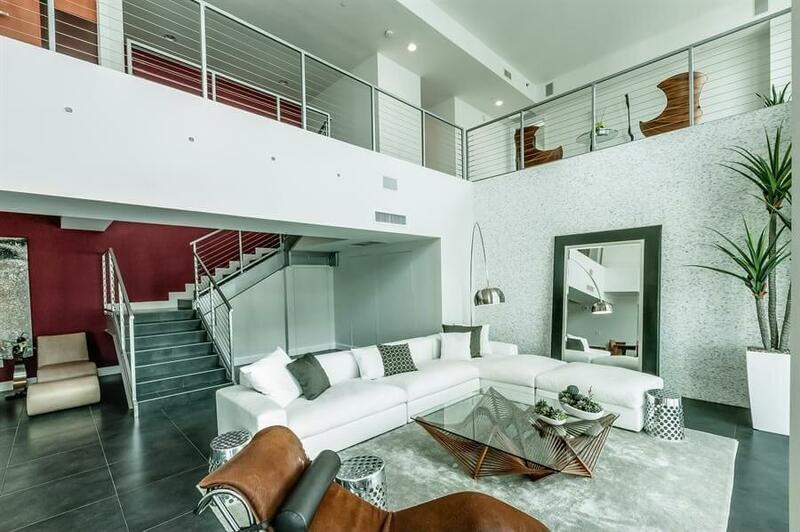 Ultra modern living room features metal framed sectional with white cushions and glass shelving over grey wood flooring, centered around innovative wood and metal coffee table. Living room features leather camel back sectional with pillow cushions in open space shared with large white fireplace under vaulted ceiling. Shop this look. 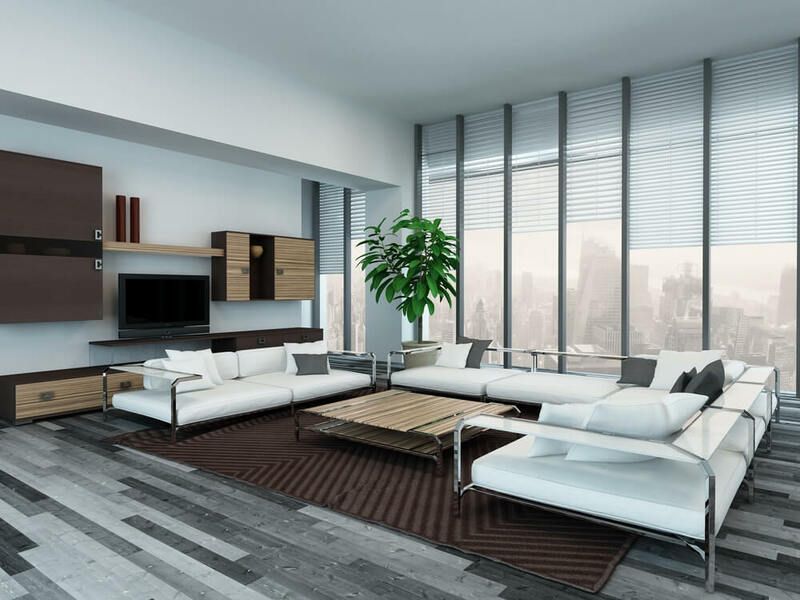 Here’s another ultra-modern living room space, replete with white sectional couch centered around unique nest-style round white table over patterned brown rug. Metal and glass staircase in background stands over dining area with “celestial” chandelier. White L-shaped sectional sofa with purple and blue pillows and round arms anchors this modern living room on large blue rug over natural hardwood flooring. 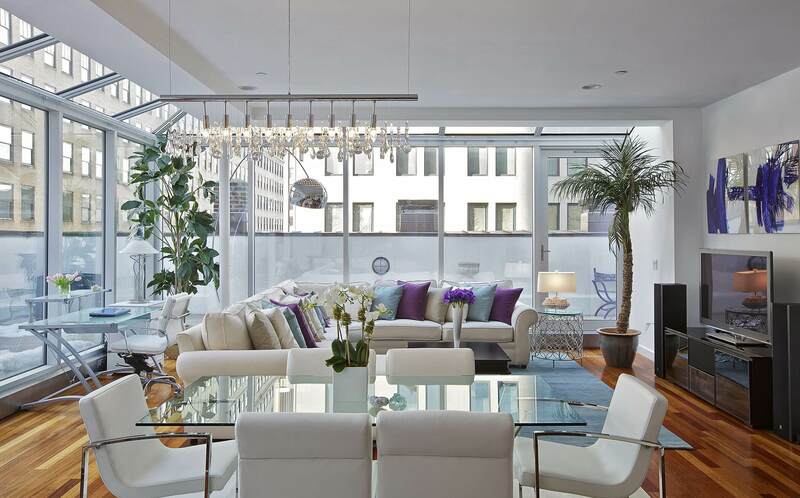 Matching white dining set with glass table shares space under floor to ceiling windows and wire hung track lighting. Shop this look. 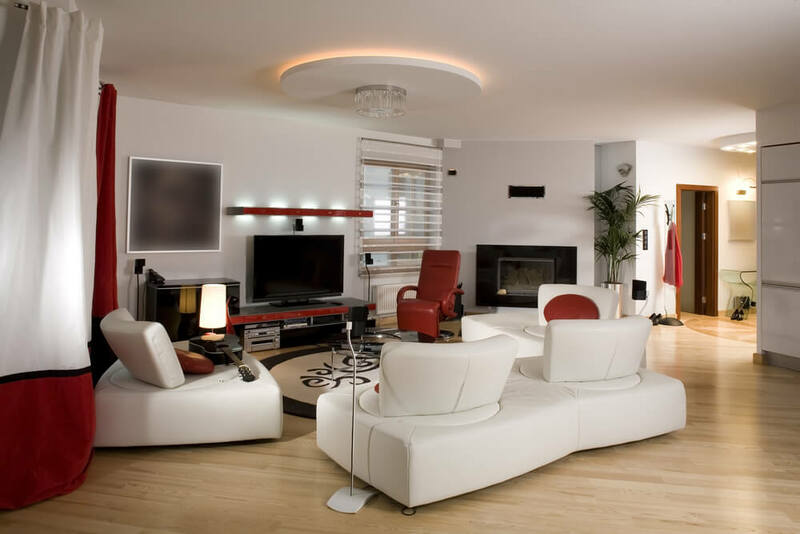 Nearly all-white living room features immense U-shaped sectional sofa with track arms and pillow back, over dark wood flooring. 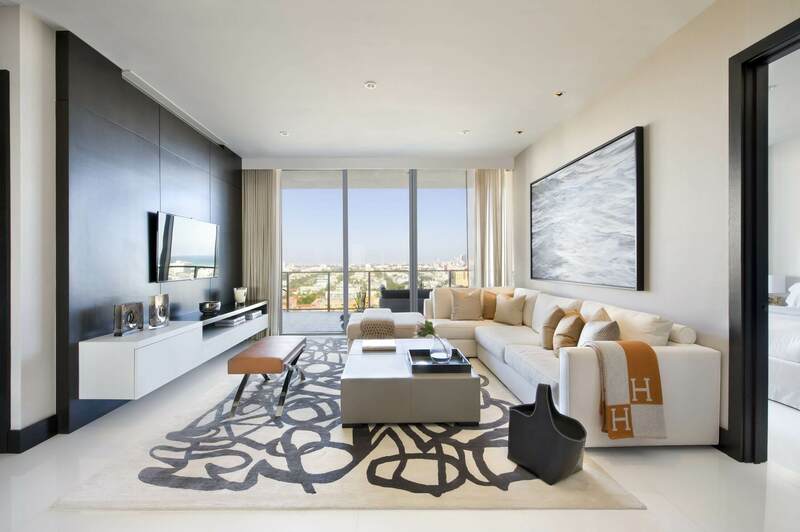 Dual living room sectional sofas pair up in this white space, with pillow backs and chaise features, around flat grey coffee tables and minimalist decoration. Cushion backed grey sectional sofa with chaise lounge sits on patterned gold rug underneath soaring vaulted ceiling in this lush living room featuring stone and wood fireplace surround in front of carved wood coffee table. Shop this look. 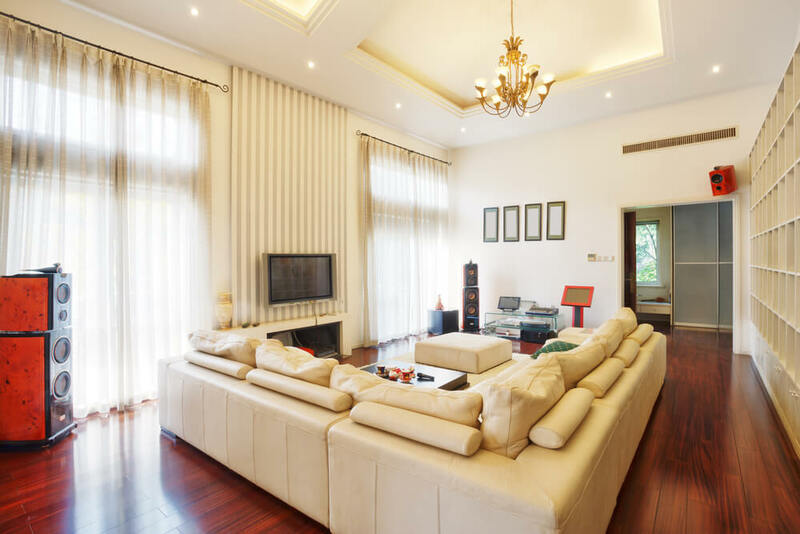 Cherry wood flooring supports large beige leather living room sectional sofa in this high ceiling space, with floor to ceiling windows facing equal height shelving under detailed ceiling with gold chandelier. Cozy living room furniture set here includes brown cushion back sectional with variety of patterned color pillows, centered around glass-topped carved wood coffee table over room filling area rug. Shop this look. 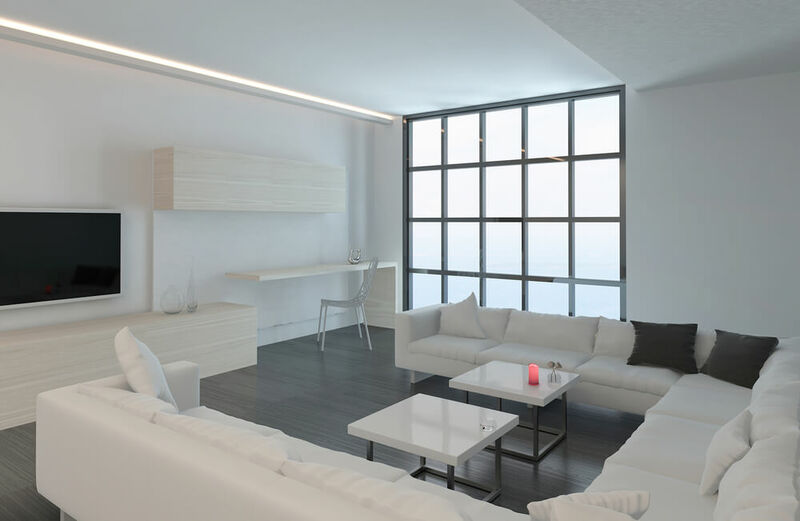 Brightly sunlit space features living room sectional couches in white over grey, centered around glass box coffee table on white wood flooring. 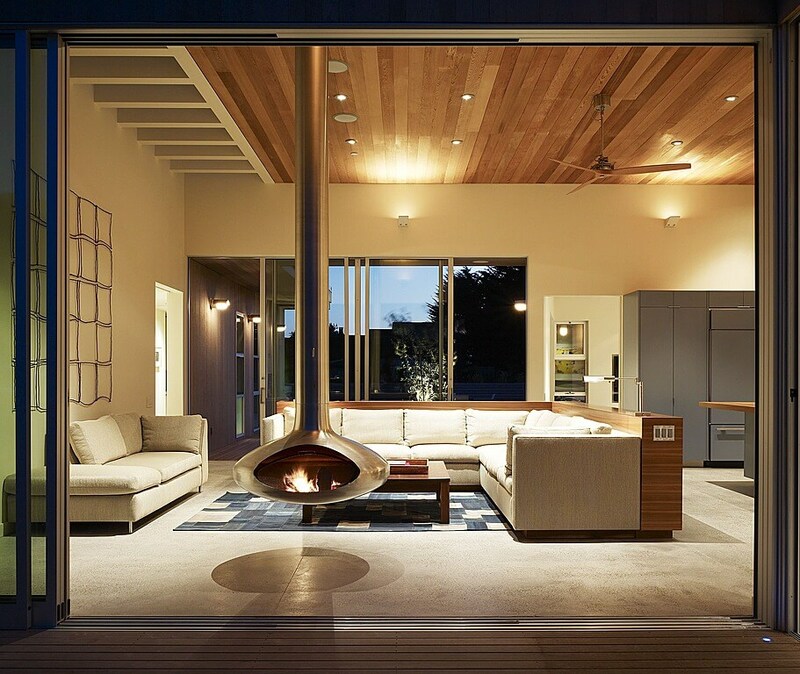 Black stone wall adds contrast to this space with floor to ceiling view of outdoors. 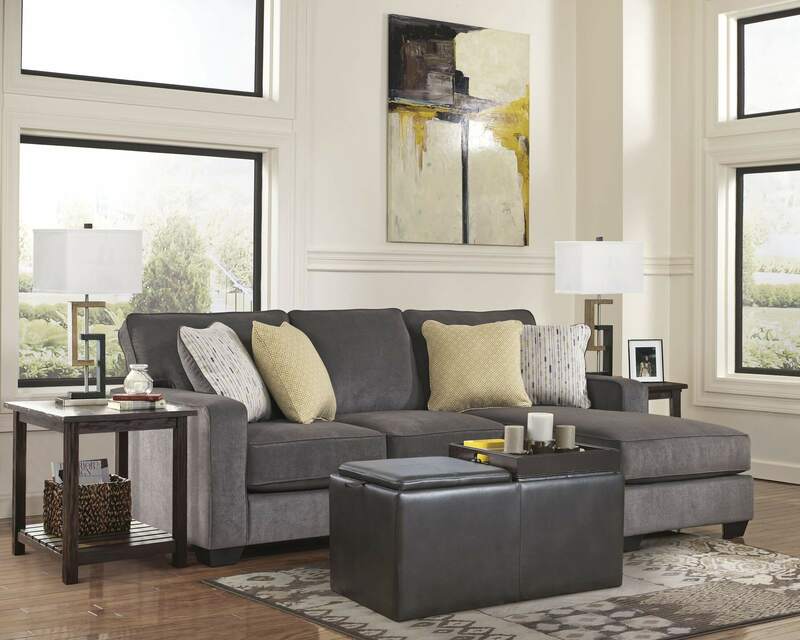 This cozy space features a simple and direct cushion backed sectional couch with built-in chaise lounge, with matching grey leather ottoman over natural hardwood flooring. Shop this look. 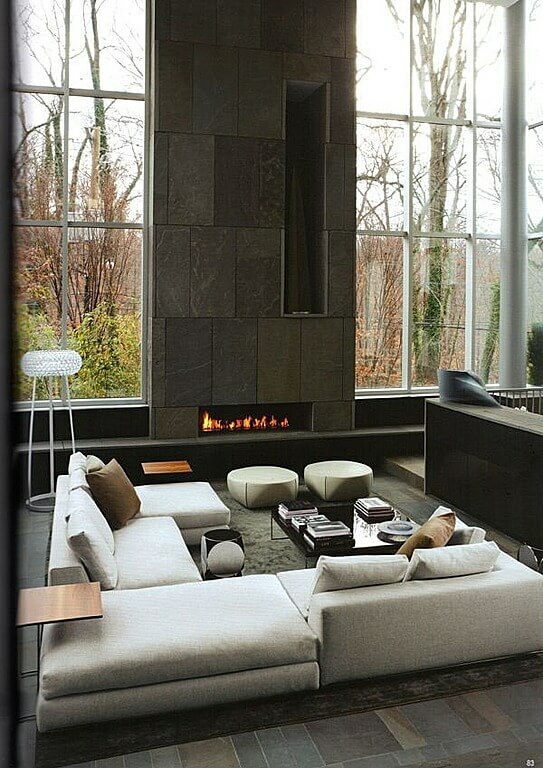 Here’s another great example of modern textures mixing with classic tones: concrete wall surface stands aside floor to ceiling windows, allowing natural light to fall on grey wood flooring and white pillow-back sectional with two large matching ottomans around black glass coffee table. 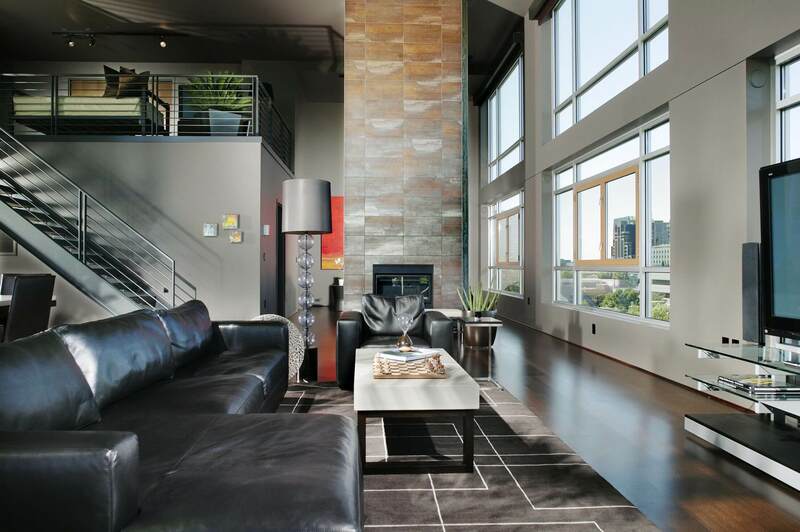 Spacious living room featuring myriad textures and tones, including black leather sectional with chaise lounge on patterned brown rug over natural hardwood flooring. 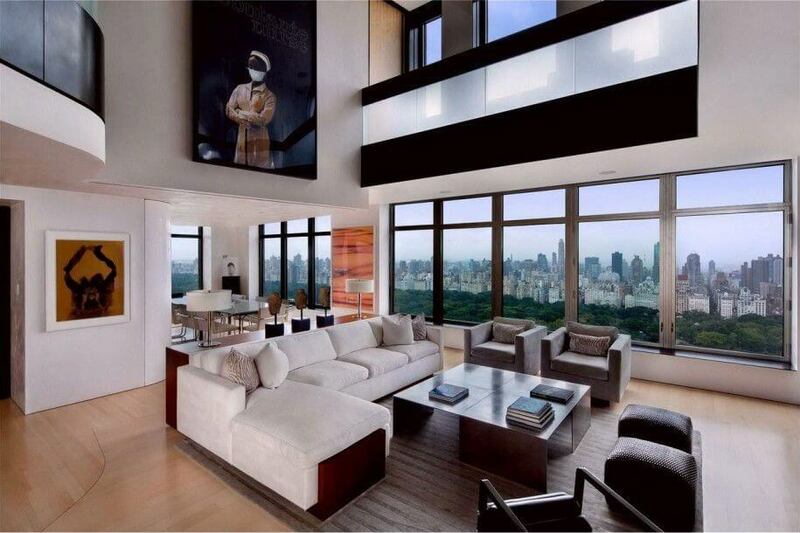 Huge two story windows light the modern look space. Shop this look. 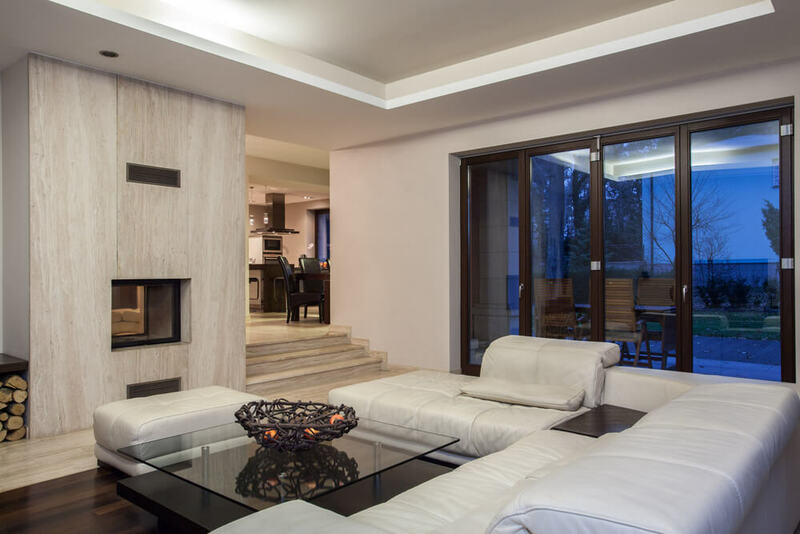 Bright white U-shaped sectional wraps around oblong glass coffee table in front of large stone-wall fireplace in this glass-surrounded living room. 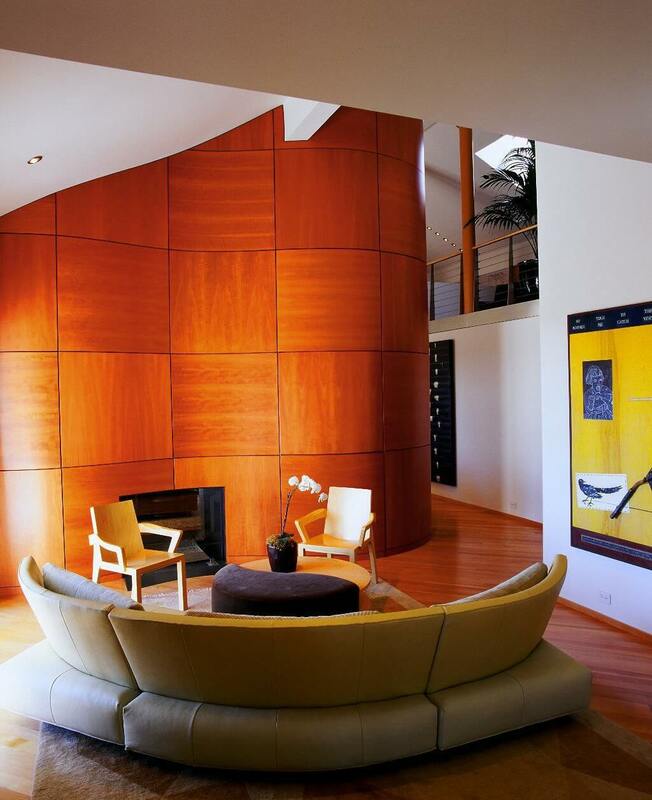 Modern semi-circular sectional couch wraps around yin-yang table in this living room flush with cherry wood, on flooring and large wave-shaped panel wall. Shop this look. 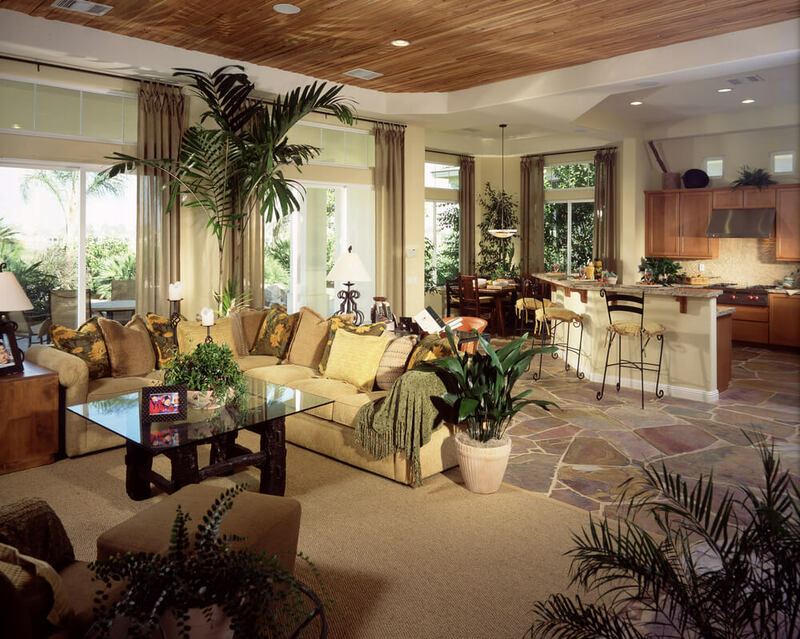 Expansive open space holds this pillow backed living room sectional sofa at its center, surrounded by rich dark wood furniture over beige marble flooring. High ceiling with exposed beams sits above space shared with kitchen area. 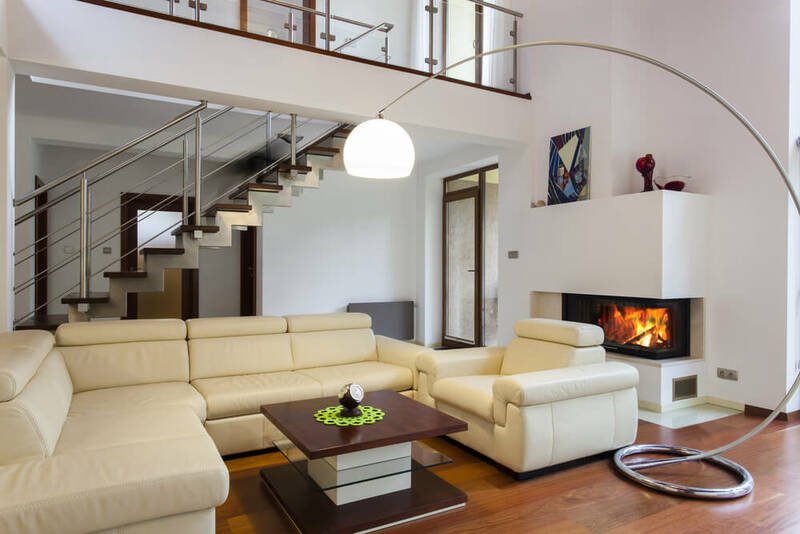 Large modern white leather L-shaped sectional sofa here fills this cozy living space over dark wood flooring, with pass-through fireplace and large black and glass coffee table. 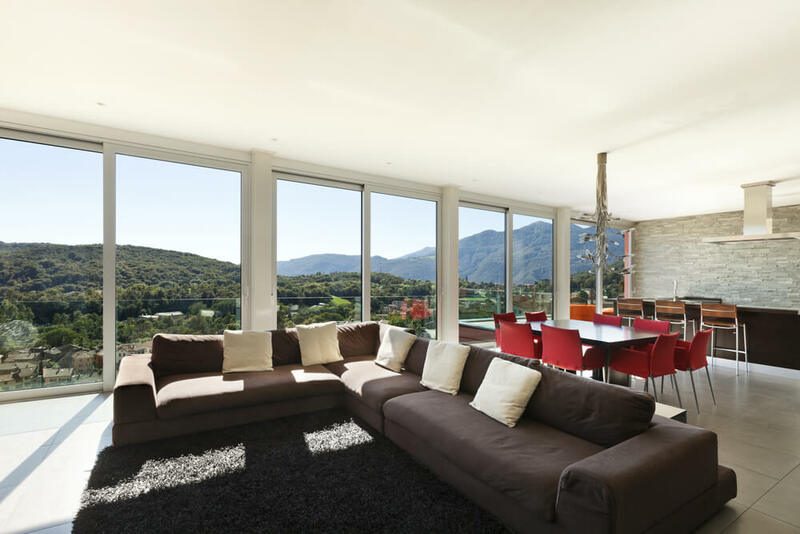 Sloped white ceiling over dark wood flooring in this living room holding modern armless brown sofa with red and cow-pattern pillows. White shag rug at center olds wood and glass coffee table, while cowhide chaise lounge sits on left. Shop this look. Modern white leather sectional with matching armchair centered around tiered glass and wood coffee table in this modern living room featuring bold chrome arched lamp overhead and white shelving over gas fireplace. Cozy living space filled with wicker-and-white sectional sofa featuring chaise lounge, wrapped around rustic wood coffee table with four matching ottomans. 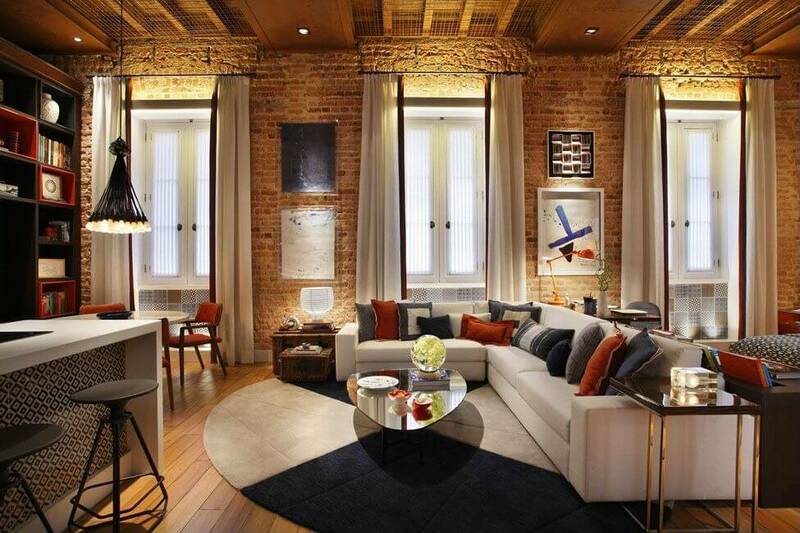 Brick wall and floor to ceiling glass on left add variety of texture and natural light, respectively. 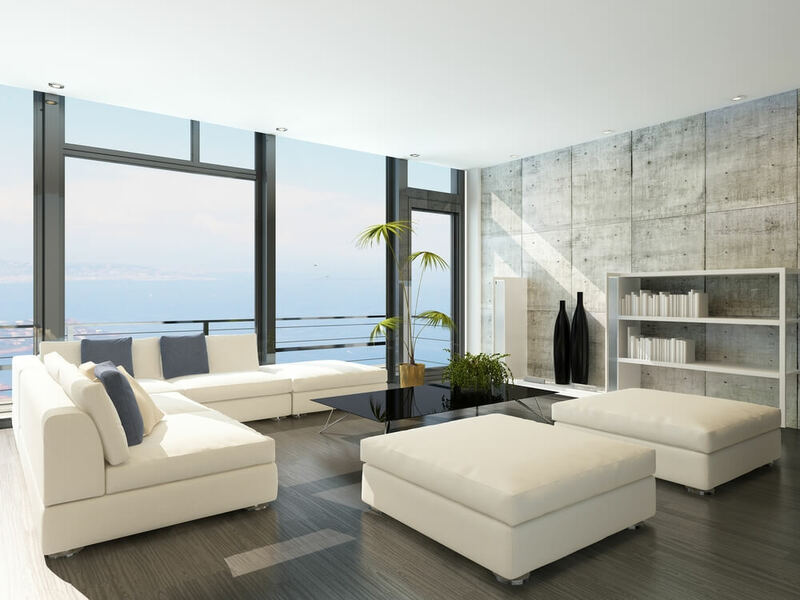 Ultra-modern living room featuring lengthy white pillow backed sectional wrapped around large grey minimalist ottoman is fully sunlit via floor to ceiling glass in distance. Slick dark wood wall on left holds white shelving and media mount. Shop this look. 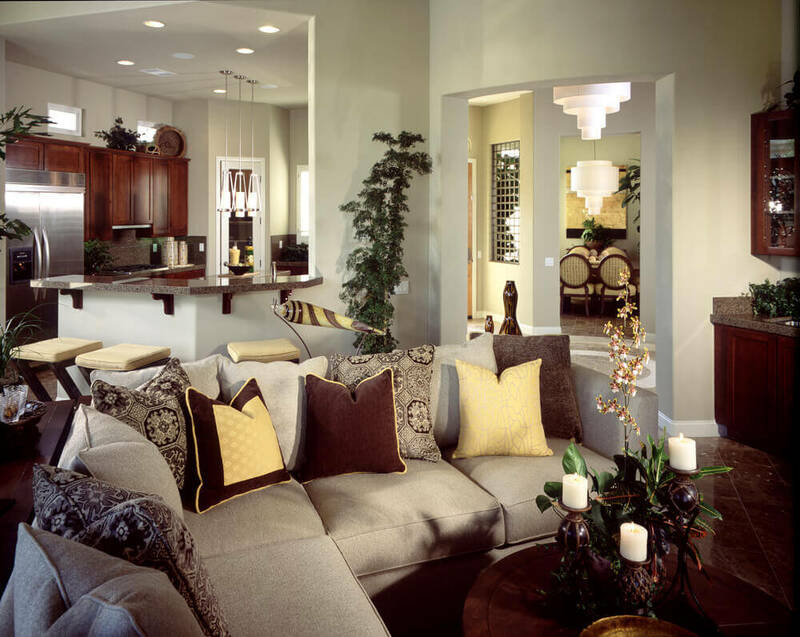 This cozy but open living room space holds contemporary grey L-shaped sectional with decorative pillows over dark brown marble flooring with nearly matching dark wood toned furniture and cabinetry. Earth tones throughout this living room, featuring grey L-shaped sectional on brown marble flooring, centered around natural wood coffee table. Natural wood media center beneath large projection screen sits across from furniture over shag area rug. 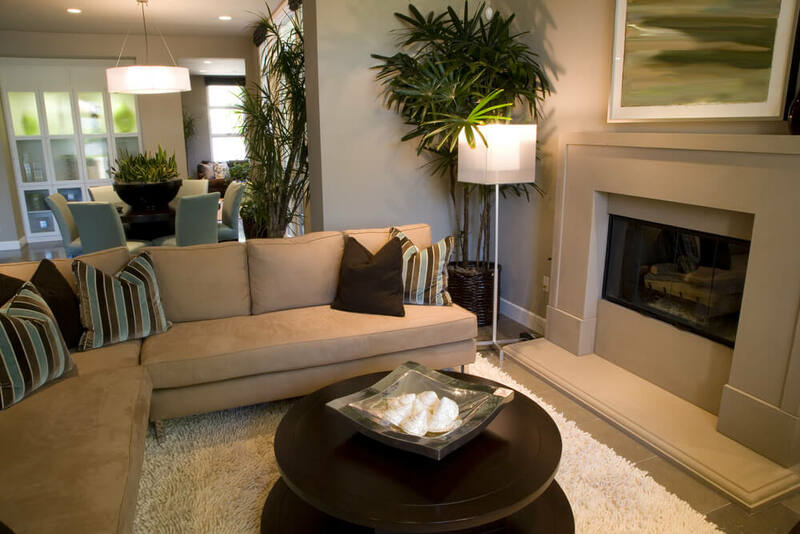 This compact white living room features dark hardwood flooring under white semi-circular sectional. 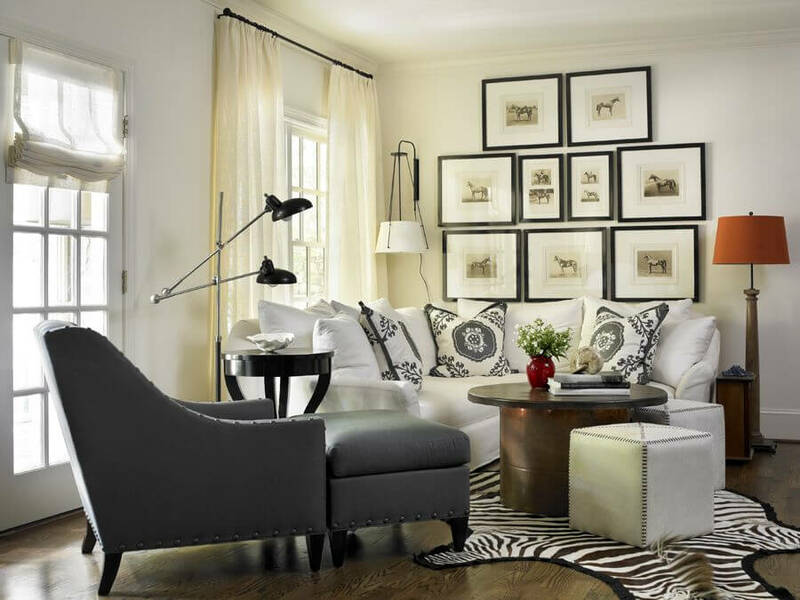 Round coffee table and white cube ottomans sit on zebra rug, with grey easy chair on left. Shop this look. 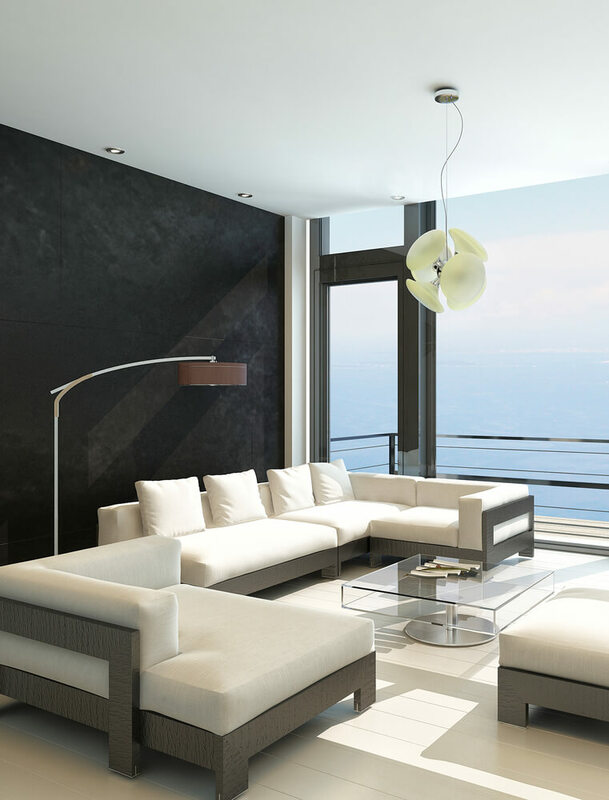 Immense marble floored living room features entire wall of floor to ceiling glass, with modern brown L-shaped sectional sofa resting on black shag area rug, read-seating dining area behind, and bar space at far end. 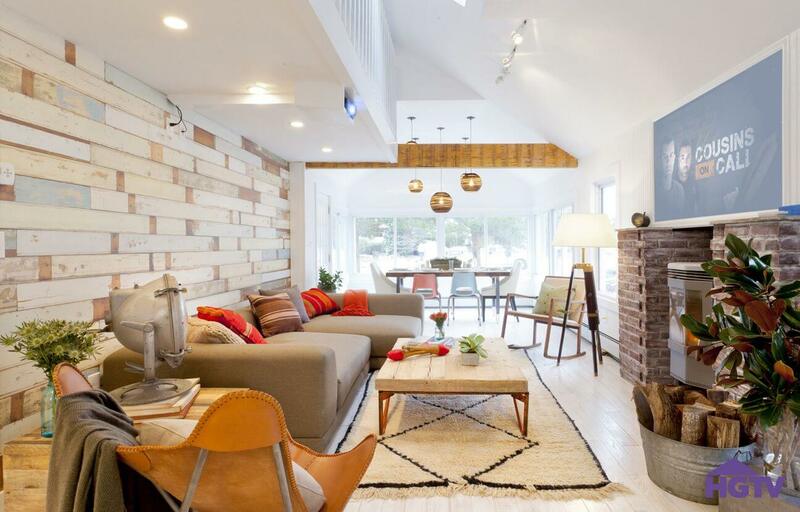 This bright living room featuring textured wood panel wall under white balcony, with brick fireplace surround across light wood flooring, holds light brown sectional with chaise lounge and large coffee table with natural wood over metal supports. Dining area with exposed beam above sits in background. Shop this look. 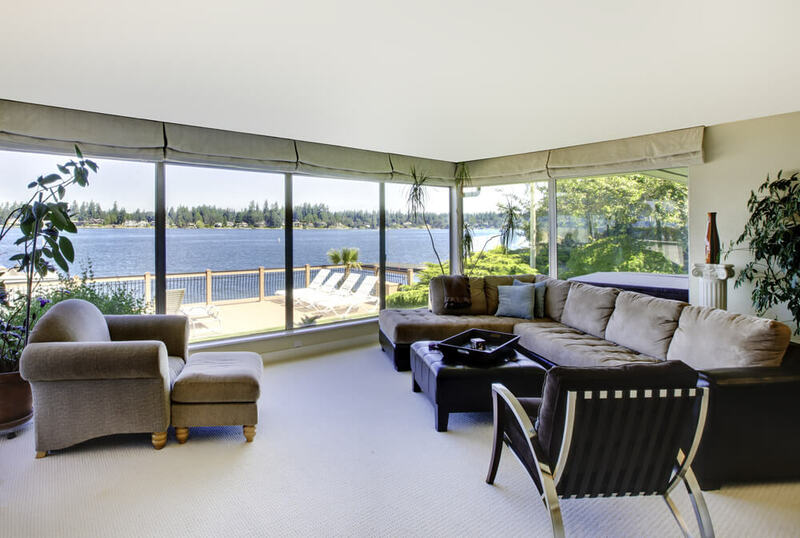 Wraparound glass naturally lights this space featuring L-shaped leather sectional sofa with brown cushion surface, surrounding black leather ottoman across from grey cloth armchair and ottoman. Expanse of dark hardwood flooring holds pillow-backed beige U-shaped sectional sofa, red leather ottoman, and camel back couch in this living room featuring stone fireplace surround with large wood mantle. Wide open living room space holds semi-circular plush leather sectional sofa with large ornate coffee table on white rug. 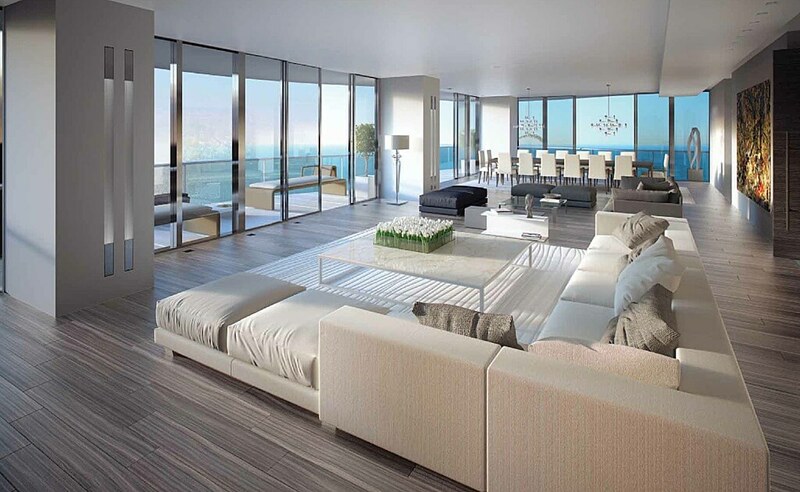 Natural hardwood flooring throughout unifies the space. 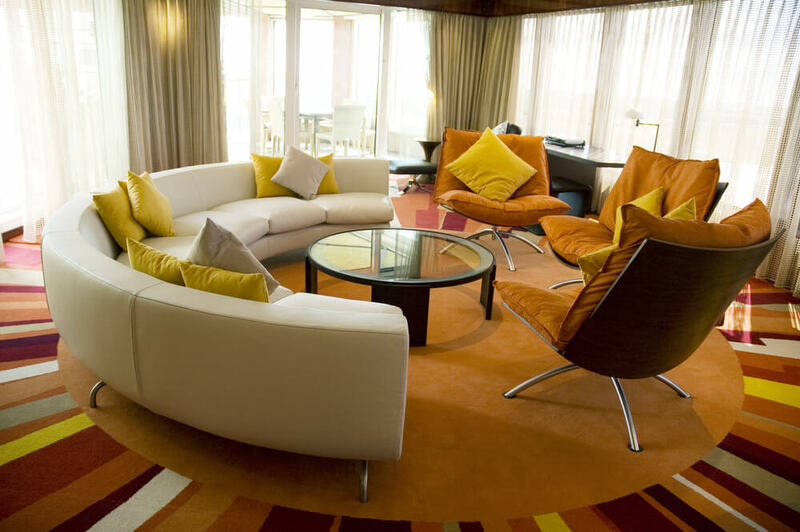 Circular living room features bright multi-colored sun-pattern carpeting, with semi-circular midcentury sectional on left, paired with plush orange cushion chairs on right. 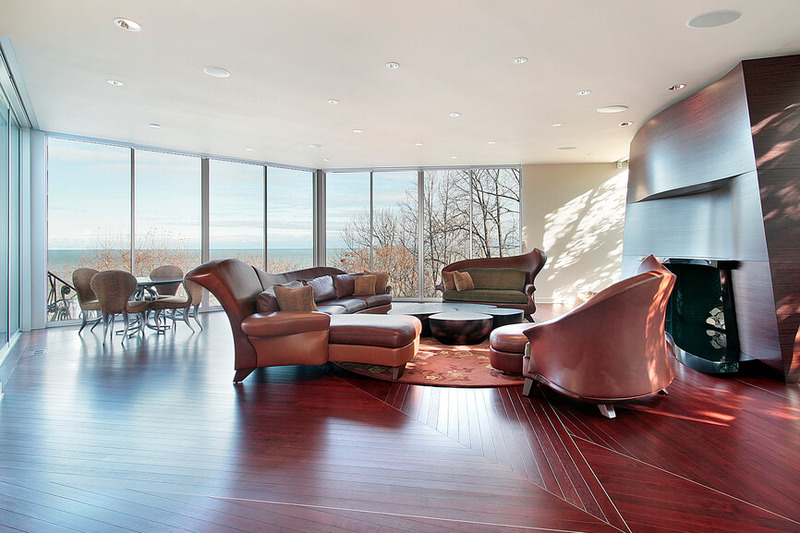 Round glass coffee table resides at center of this sunlit space. 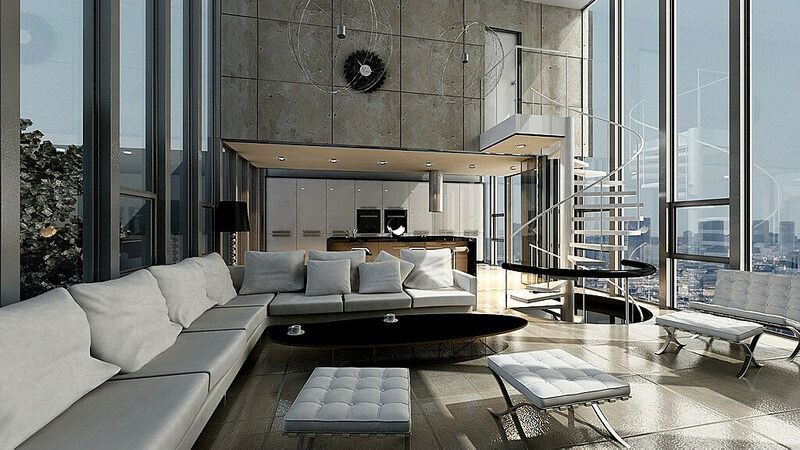 This ultra-modern space includes multiple white living room sectional couches with unique rotating backs, centered around circular rug mirroring ceiling detail. 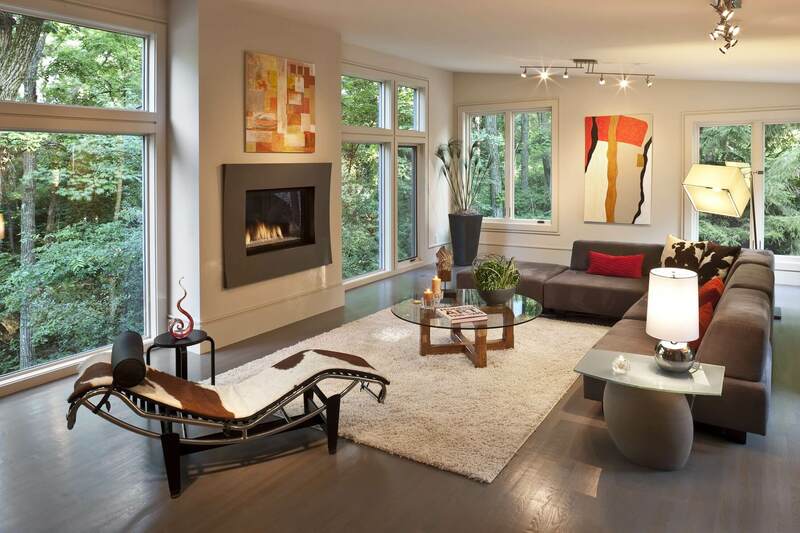 Red leather and wood touches contrast with black decor and light hardwood flooring. Here is a more cozy space, filled with pillow backed L-shape sectional couch, large dark wood coffee table, and wicker armchair next to white fireplace. Another cozy living room, this one featuring light mocha sectional and matching fireplace surround, with round dark wood coffee table and white shag rug in between. 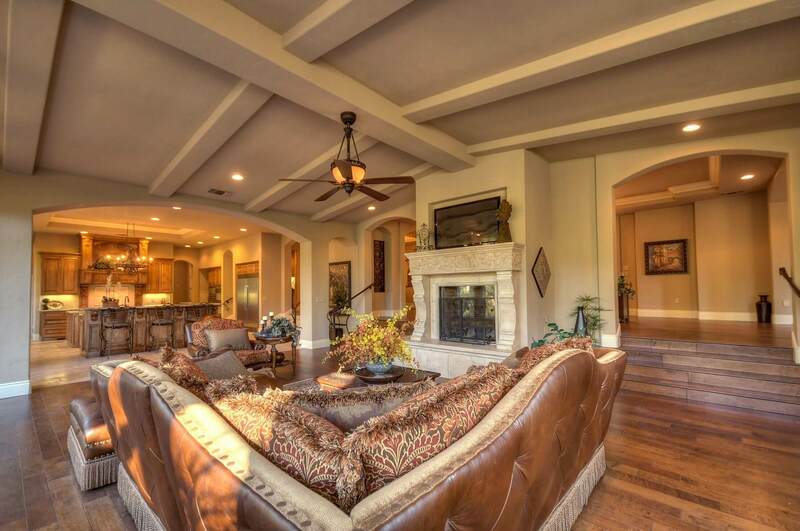 Naturally lit living space is flush with cherry wood, featuring ornate leather camel back sectionals and carved-wood fireplace surround reflecting organic curves throughout.